There is a quality that is hard to define but is essential for a great Lego game, John Smith told me yesterday. The man who helps make the many popular Lego video games was trying to articulate it for me. "When you think, 'I wonder if there's a...'"
He paused, playing the role of pondering, curious gamer. Mystery. Discovery. Curiosity that leads to satisfaction. Lego Pirates of the Caribbean, scheduled for release this spring close to the release of the fourth movie in the famous Disney series, is the latest in a line that has included Lego Star Wars, Lego Rock Band, Lego Harry Potter and a bunch of others. Smith showed me the game yesterday and offered lots of the expected details but also gamely tried to articulate what he thought was special about this long-running series and its subtle progression in quality. He was telling me how the game will cover scenes from all four Pirates movies and will present the familiar Lego gameplay formula of one or two-player adventure that mixes combat with collection and investigation. You'll control many of the heroes and villains of the movie series, including Jack Sparrow, zombie pirates, even a dog. Clumps of them have special abilities. (The women can jump high; Sparrow can use a compass to find hidden treasure; etc.). You'll play through the movies, starting with any of the four, and can re-visit the levels with extra characters to unlock secrets. I was asking about the feel of the game. I've played most of the Lego games and noticed Pirates appears to use tighter, lower camera angles. Correct, Smith said, which helps showcase the characters. I noticed it had more combat than the unusually exploration-oriented Lego Harry Potter. Correct, Smith said. The game has the series' more traditional balance of fighting and exploring. Smith wanted to explain to me how sharply-honed he believes his team's ability is in this new Lego game to present satisfying gameplay mystery, the kind of intrigue that makes a player want to poke around. He was looking for the right way to put it as he ran through one of the game's early levels, rounding up members of a pirate crew by solving puzzles and building stuff. He wasn't quite finding the words that could express his point. I was moving on to other topics, asking about vehicles (well, you can ride pigs and donkeys), asking about pirate ship battles (there will be bonus vehicle missions), asking to see the ability for characters to walk underwater if they pull an upended barrel over their body (he showed me that move). Near the end of his time demonstrating the game, Smith got to the beach scene shown in the image atop this post. He was controlling series hero Jack Sparrow. He used Sparrow's compass power, which pointed to an X on the beach. That X led to another and then to the hint of buried Lego pieces. Those pieces could be dug up and built into posts. The posts stood in a row that disappeared into the foreground. Smith made Sparrow hop onto one, then to the next, and then the next. As he did, the final post came into view. On it was a treasure chest. Smith suddenly relaxed. That was it, he told me. *That* is what he was talking about. If you think that, maybe, possibly, there should be something hidden, then the developers of Lego Pirates of the Caribbean better be sure that something is going to be there. It better be fun to find it. That's the magic, he said, if they get it right. And that's what pirates are about, he noted, isn't it? Finding treasure. Yes, and swordplay too. 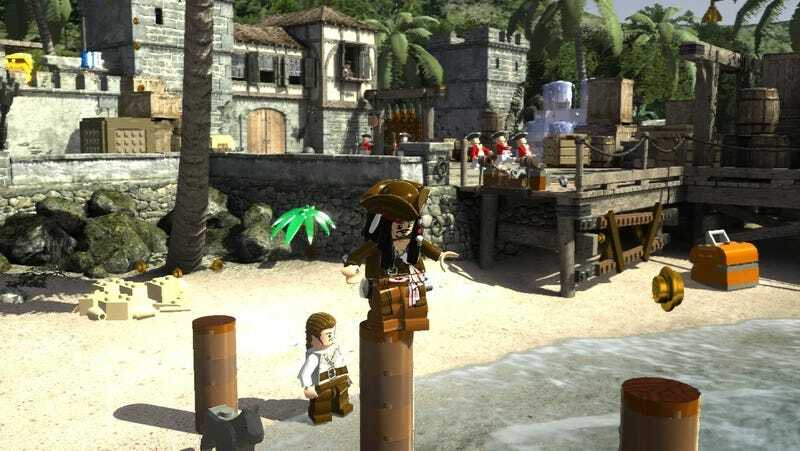 Lego Pirates of the Caribbean may be exactly what fans of the movies or the Lego games would expect it to be. No special frills, no huge new features. That familiarity won't be a problem if that ethereal quality Smith tried to show me yesterday, permeates the game. We'll see this spring.